As Noojee is a provider of call centre systems its probably doesn’t come as a surprise to you that we encounter lots of people and organisations looking to starting a new call centre. From our conversations we see a lot of reoccurring mistakes that newbies to the industry make. As such I thought it worth putting up a bit of a Beginner’s Guide to Starting a New Call Centre. Firstly let me say that I’m not going to talk about staffing. I’m a technology guy so I’m going to leave that one to the experts. The only thing I will say; expect a high turn over of staff! Like buying a home, starting a new call centre is all about location. Firstly your office has to be well located to make recruiting staff easy (oops did I just mention staff). Being located near public transport is always a good idea, and a location near reasonable facilities (shops etc) will make you work space more attractive to potential recruits. This is the first big misstep that we see when starting a new call centre. You would not believe the number of calls I’ve taken from new call centre owners telling me that they have just signed a new lease on an office and they would like to have it up and running in 3 weeks. Well, that’s just not going to happen! Most service will take at least 20 business days to be installed – IF YOU ARE LUCKY! And yes these are real conversations (well… you know what I mean). So BEFORE you sign a lease, call your telecommunications provider or call centre technology provider (that would be Noojee wouldn’t it 😉 and check that you can get a decent internet connection and/or the required number of telephone lines. So it turns out you can get an internet connection to your office, but is it the right type of internet connection? Yes, there is more than one type! So the first questions is, what are you going to use your Internet connection for? If its just for a bit if internet surfing and the occasional email and you have no more than say 15 staff, then you can probably get away with an ADSL2 connection (this is what most people have at home). But not all ADSL2 connections are the same! Basically the further you are from the exchange, the slower your internet connection will be. Again, check with your internet provider BEFORE you sign a lease to check out what the estimated speed is for your new office location. Most contact centres are moving away from old fashion Telstra copper telephone lines and moving to using the internet to make their phone calls (this is called Voice over IP or VoIP). At Noojee we strongly recommend using VoIP (we tend to call it SIP, but SIP is just a particular flavour of VoIP). Whilst VoIP does have some down sides, if done properly these can all be mitigated and the up side is considerable. VoIP services are nearly always cheaper and are far more flexible. If you go down the VoIP path it’s also possible to have staff working from home, provided they have a reasonable internet connection at home (a typical home ADSL2 connection will normally suffice). Now if you want to use VoIP for your voice calls then you need to put in a business grade internet connection. If you have less than 6 staff and your office is under 1km from the exchange you ‘might’ be able to get away with a Business grade ADSL 2 connection but in most cases you will need something with a little more grunt. So I’m going to take a little side journey to explain some basics about the internet, as its the lack of understanding of these basics that bring a lot of people undone. So when you buy an internet connection it will essentially be rated for a particular speed. So what do we mean by ‘speed’ when we talk about the internet? At a simple level it equates to how long it takes to download a web page. Have you ever been streaming a YouTube video and it stops for a few moments and then starts again? That happens because your internet connection isn’t’ fast enough (where is the NBN when you need it!). Internet connection speed is measured in Mega Bits (Mb). A helpful way to think of the connection speed is to think about your garden hose. You can buy garden hoses in different sizes from tiny ones that are good for drip feeding your vegetables all the way up to the hoses that fire engines use to put out your house fire. Basically the bigger the hose the more water can be pumped down it. Internet connections are the same, the bigger the Mb the more videos, web pages or VoIP calls that can go down it. So as the Mb gets bigger the diameter of your garden hose gets bigger. What a lot of people don’t realise, is that internet connections are also like garden hoses in that water only flows in one direction down a garden hose. Well, internet connections are the same. To get around this you essentially have two internet connections. Yes, I know you only have one telephone line, but without getting too technical, you need to think of your internet connection as two separate garden hoses with water flowing in opposite directions. One connection brings water to your house and the other takes water away from your house. In our garden hose analogy, when you receive (referred to as downloading) an email, browse a web site or watch a You Tube video, water is flowing to your house. When you send (referred to as uploading) an email, water is flowing from your house. So why do you care? Well the problem with an ADSL 2 connection (the typical home and small business internet connection) is that the garden hose that brings water to your house is, lets say, the size of an average garden hose. The problem is that the size of the garden hose that takes the water away from you house is only the size of a drip feed hose! So, on a typical ADSL connection you might be able to download at a speed of 12 Mb (average garden hose) but you can only upload (like sending an email) at 0.5 Mb. That means that you can receive the likes of an email at 24 times the speed that you send it. Now for most people that fact that sending is very slow doesn’t matter, as most of the time we spend our lives downloading (browsing the web, watching YouTube and LOL cats). For a call centre wanting to use VoIP to make phone calls, life is a little bit different. During a VoIP call when you sit and listen to the other party you are downloading (using the average garden hose) however when you speak to that person you are now uploading which uses that tiny drip feed hose and that’s were problems begin. I’m not going to do the maths*1 so you will have to take my word for it, but on a typical ADSL 2 connection you might possibly get 6 staff working (2-3 is more likely) but as soon as anyone uses your internet connection for anything else (like sending an email) it is going to affect your call quality big time! So if you were brave enough to wade through Internet 101, you are now an expert (something about a drip under pressure seems kind of appropriate just now) on Internet connections. So what sort of internet connection should you install. As I will keep repeating you need to ensure that you can get the recommended connection at your location BEFORE you sign a contract. If you aren’t sure then give us a call and we can do a site search for you. The size and type of Internet connection then all depends on the no. of staff making calls and what other things you are going to use your internet connection for. So let me try and over generalise and give you some rules of thumb. 1-3 staff You can probably get away with an ADSL 2 connection provided that no one else uses the Internet whilst your staff are dialing. 3-6 staff If you are less than 2 km from the exchange you can probably get away with installing two (2) ADSL 2 connections. One for the VoIP calls and one for general Internet browsing. This ‘separation’ will require some advice from your local IT provider but isn’t two hard to organise. 6-15 staff You will need a 10Mb SHDSL connection or similar. You can get one of these for around $260 pm. At first sight you might think this is slower than some ADSL 2 connections. The difference is that this connection is 10Mb in both directions which is critical when makeing VoIP calls. 15-20 staff You will need a 10Mb SHDSL connection (as per 6-15 staff) plus an ADSL 2 connection. The 10Mb will be used for VoIP and the ADSL 2 connection will be use for general Internet surfing. 20+ staff At this point you should be thinking about a 20Mb+ SHDSL connection. There are actually some good fibre optic options at 100Mb but the availability is still fairly limited. I would start praying to the Internet gods to deliver NBN (to the home not the node*2) in your area soon rather than later. You need to assume that it will take AT LEAST 20 business days (1 month) to get services connected from the date you order and pay for them. Often these can blow out to 6-8 weeks. Location is critical both for staff access and availability of services. We recommend using a VoIP service for making calls. Use the above guide to determine what size and type of Internet Connection you need. Assume that it will take at least 20 business days to get services connected. I think that’s enough for today. Next week I will publish part two of ‘Starting a new call centre‘. Noojee Telephony Solutions is a specialist provider of Contact Centre Solutions, providing both Cloud and on site systems. Noojee’s systems are all developed and supported in Australia. 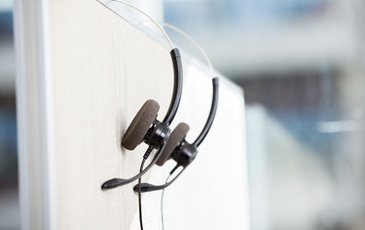 If you think we can help you with your call centre needs then give us a call on 1300 666 533. *1 Well OK, I did do the maths but you will have to go see our wiki for the gory details. *2 Let me start by saying I didn’t vote for either of the major political parties. The NBN is a fantastic idea, proposed by one of the most technically illiterate politicians I’ve ever seen. If you are a small business owner, the NBN will literally change your life. But we need fibre to the home (or business as it were) not this half a**sed fibre to the node. Internet connectivity across Australia is appalling and its holding back business. The 25Mb that is currently being proposed just isn’t going to cut it. Oh and its not about the no. of HD TV shows you can stream at once. Its about staff working from home and how long it takes them to save a document to the office network. For teleworking to be viable we need similar speeds to what we have across the office network. When you install a 100Mb network at the office, no one asks staff how many tv shows they want to watch! The NBN is about productivity not Youtube.